☆☆☆☆ “Although comedy may provide the spoonful of sugar that relieves life’s bitterness, it can also be used to emphasise its cold, relentless injustice … So it is with A Very English Scandal, which tells the true story of UK MP Jeremy Thorpe’s gay relationship with Norman Scott in the early 1960s – a time when male homosexuality was still illegal in England – and his subsequent 1979 trial for trying to arrange Scott’s murder.” — Stuff. ☆☆☆☆ “Well! I did not see that coming! And, hopefully, no one else will either, unfamiliar as we are with the case of British politician Jeremy Thorpe. Suffice to say this clever three-part drama from Russell T. Davies takes a true story from England in the mid-20th century and creates something blackly hilarious through a combination of brilliant casting, narrative sleight of hand, and classic Davies daring.” — Sydney Morning Herald. ☆☆☆☆ “Repression, denial and gentility are the pillars of this high-end show, written by Russell T. Davies (Queer as Folk, Doctor Who) and directed by Stephen Frears (The Queen), based on the book by John Preston. And when those pillars topple, what results is a juicy, wild lesson in British queer history, a story that’s able to hold a sense of moral fury toward the hatred that gay and bisexual men (and women) faced while still finding the tabloid outrageousness at hand titillating. A Very English Scandal is a dazzling three hours and in pace and potency puts The Crown to shame.” — New York Times. 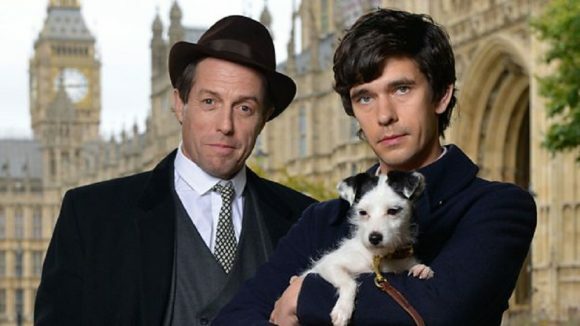 ☆☆☆☆ “There is an eccentric bit of electricity that runs through A Very English Scandal, one of the tightest and brightest and most sublime miniseries — running at a meagre three hours, one hour per episode — that you’re likely to see on television in 2018 … And it’s all based on a true story almost too weird, funny and heartbreaking to be real, complete with a bizarre twist that popped up just this month after it aired in England.” — The Hollywood Reporter. ☆☆☆☆ “It is a drama as brutally funny, endlessly clever, justifiably confident as its protagonist; an immaculately-scripted hour that entwines two decades of salient political history with a finely-worked portrait of the English establishment, shaping and being shaped by a certain kind of man protected by certain privileges and labouring under a particular kind of fear.” — The Guardian.